For Anthony Thompson, president and CEO of Kwame Building Group, every day is black history day. The members of the new creativity club for boys at Pierre Laclede Junior Career Academy in North St. Louis learned this when he visited the club on Thursday, March 15. “Who knows anything about slavery?” Thompson quizzed the youth, who had been expecting a presentation on recording music from him. Thompson also is a musician and producer at his own TBeats Studios. One youth raised his hand; they are all either fifth or sixth graders. “In slavery, they separated families and beat people up,” the boy said. 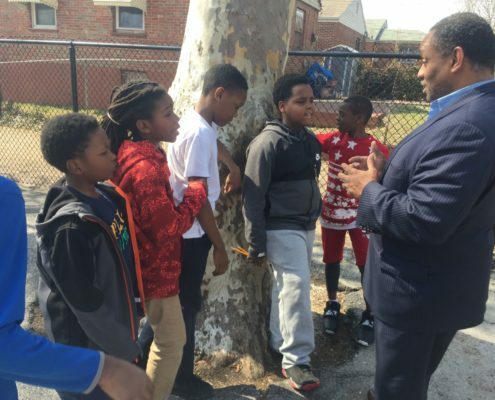 In fact, Laclede Principal DaMaris White formed the club hoping that consistent male attention and encouragement would settle down the older boys in the school and, among other goals, get them to stop fighting so often. The building has almost no male staff. Another youth raised his hand. “In slavery, black people could not get an education,” the boy said. That’s why they were getting this lecture, instead of the expected presentation on recording music. Thompson found the boys had difficulty paying attention when he started his presentation on music in the school library, where the club has been meeting. The impromptu black history lecture was taking place under a tree on the school playground, since they moved the boys outside on a beautiful sunny day to let the more restless boys play, rather than be forced to listen. The tree lent an accidental air of an African elder speaking to youth out in the open. The intention of Thompson’s question was not merely to chastise. Rather, he made the unusual and inspired move to use slavery as a motivational tool. The boys, who had been so restless in the library while being told about recording music, were very intent under the tree while listening to a powerful black man talk about the greatness of their African heritage. This was only the club’s third meeting. At the two previous meetings, the boys heard from former St. Louis Fire Chief Sherman George, an editor from The St. Louis American whom White asked to form the club, and Wiley “Chip” Price IV, a former rapper and music promoter now running for state representative in District 84, where the school is located. The boys’ club, as yet unnamed, evolved from Academy Journalism, which has met at Pierre Laclede every Thursday all school year. White asked an editor from The American to start that club to improve her students’ reading and writing skills. While that club has gone very well, all but one boy who has attended meetings dropped out. White explained the boys ended up fighting with other boys and losing their club privileges, or lost interest through male peer influence. That’s why she commissioned the new club for boys. Even after the inspiring speech on slavery, two of the boys squared off for a fight until one of the club organizers got between them and prevented them from coming to blows. One of those boys, in fact, had dropped out of Academy Journalism over fighting, so this was a real test of the new club’s mission. “Why are you fighting?” that boy was asked by the club co-organizer, who also had taught him briefly in Academy Journalism. The boy said he was retaliating over a personal insult based on his appearance. He was told that was no reason to fight, which only makes things worse, and the other boy was told not to insult people. At least on this day, these two descendants of the greatest people from Africa went back into their school building without fighting. 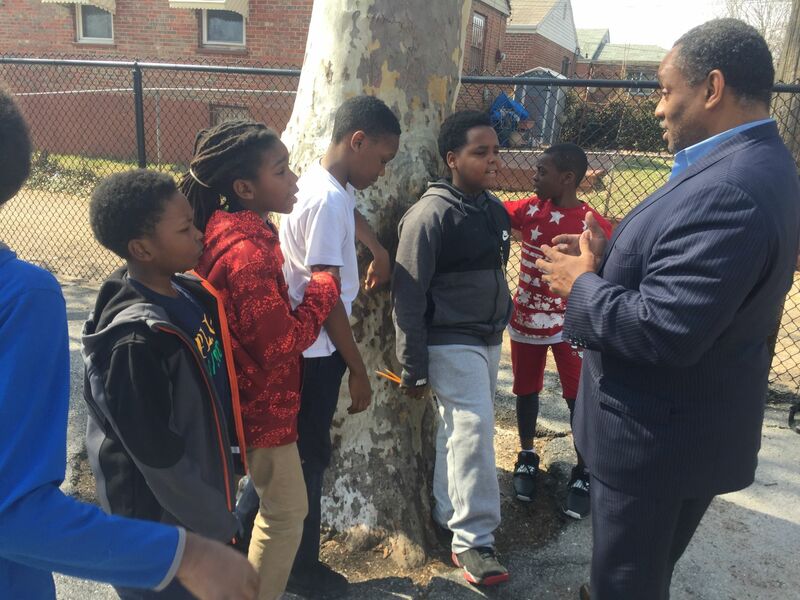 Next up after Spring Break: boys club organizers plan the school’s inaugural Boys week with club members.